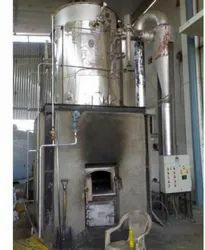 Prominent & Leading Manufacturer from Ahmedabad, we offer coal fired thermic fluid heater, vertical four pass wood thermic fluid heater, thermic fluid heater, oil fired thermic fluid heater, gas fired thermic fluid heater and gas fired thermic heater. Our offered Coal Fired Thermic Fluid Heater comes in a vertical design coupled with integral furnace that provides an assurance of an elevated output with any solid fuel like coal, wood, husk, bagasse etc. Furthermore, the radiant heat exchanger above the furnace keeps the heat exchanger cools that lessens excess air is needed and system ensures minimum infiltration of unwanted air through fire doors. This can be availed at leading market rates after it is tested before it is made for customers use by our engineers to ensure compliance. 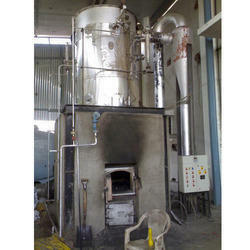 We are the largest manufacturer and exporter for Vertical Four Pass Wood Thermic Fluid Heater. We have gained expertise in delivering a premium quality range of Vertical Four Pass Wood Fired Thermic Fluid Heaters. 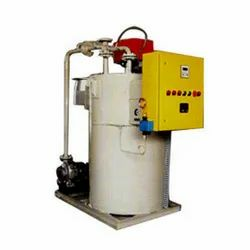 These Vertical Four Pass Wood Thermic Fluid Heater are manufactured using excellent quality raw material, following international guidelines and standards. The products we offer find extensive application in varied process of heating. We also customize our range as per the needs and demands of our patrons. We are able to offer Thermic Fluid Heater to esteemed clients. The offered range is acclaimed in the market for rendering high thermal efficiency and is available in various capacities so as to meet the preferences of clients. In addition to this, the offered range is available with fluid pipelines and storage tanks. This range is acclaimed in the market for easy installation. These energy efficient heaters operate on on liquid & vapor phase. Furnace with fire doors & ash doors. 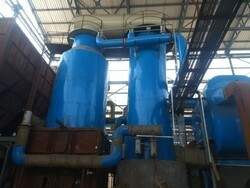 Thermic Fluid system pressure high due to system valves closure etc. Pressure switch cuts of ID Fan and alarm. Safety relief valve (Optional) to be provided in the system piping so as to by pass the oil. Diesel Engine (Optional) keeps thermic fluid moving to avoid overheating and overflow of oil. Exhaust with Damper provided on furnace to drive away hot gases directly. We also cater the export orders from major countries like Bangladesh,Kenya,Srilanka,South Africa,Nigeria,Iran,Saudi Arabia,UAE,Kuwait,Iraq,Philippines,USA,UK,Ghana,Germany,Canada and many more other countries. 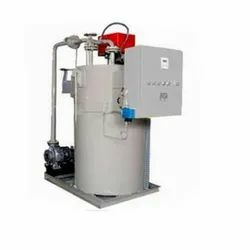 Driven with perfection, we are engaged in catering to the variegated requirements of the customers by bringing forth a comprehensive Oil Fired Thermic Fluid Heater. These fluid heaters are developed utilizing optimum-grade raw material in accordance with the industry set guidelines at our state-of-the-art infrastructure facility. In addition, these fluid heaters are known for their features like robust construction and longer service life. 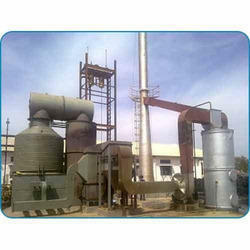 We are the top-most Manufacturer, Supplier, and Exporter of Gas Fired Thermic Fluid Heater. Our Gas Fired Thermic Fluid Heater is mostly used in the process of heating applications. It is a highly efficient heater with low energy consumption. We offer this Gas Fired Thermic Fluid Heater in various capacities, dimensions and specifications to meet the varied needs of clients. Moreover, our Gas Fired Thermic Fluid Heater meets the international standards in respect of quality. 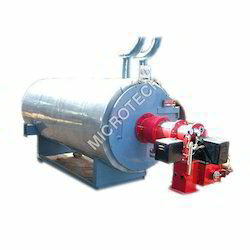 "Microtech Boilers" introduce Coal Fired Thermic Fluid Heater is suited for Indian industries in rapidly changing and undependable energy situations. The vertical design coupled with integral furnace gives you an assurance of a rated output on any solid fuel like coal, wood, husk, bagasse, etc. Microtech Boilers's generous design helps in changeover from one fuel to another without compromising on performance. This quality assure product comes from Microtech Boilers, the company known for its expertise of boilers and heaters all over India. Radiant heat exchanger above furnace, cools hence, less excess air is needed. This gives rise to efficiency. Combustion air from FD fan passes through air preheater to absorb the waste heat from the fuel gases. This result in further increase in efficiency. This system ensures minimum infiltration of unwanted air through fire doors. Hence, all the combustion air passes through the APH. Thus the maximum heat recovery from APH takes place, which ensures rated efficiency. Thermotech's vertical heater model gives you rated efficiency & its categorized output. The system is suitable for coal, wood, bagasse etc. for full output with minor modifications in combustion chamber. Steam Coal: 4500 kcal / kg. Lignite Coal: 3500 kcal / kg. Agro - Waste: 3300 kcal / kg. Our customers can avail Gas/FO/LDO Fired Thermic Heater from us. The offered range is manufactured utilizing optimum grade raw material and modern machines in strict adherence with the international quality norms. Moreover, the offered range is highly acclaimed in the market for its high performance and excellent service. Offered range is available with high operating temperatures with low system pressure. Low Thermic Fluid Level in Expansion Tank Level Switch actuated at expansion tank cuts of the ID Fan / FD Fan. Thermic Fluid system pressure high due to system valves closure etc. Pressure switch cuts of ID Fan and alarm. Safety relief valve (Optional) to be provided in the system piping so as to bypass the oil. Power Failure Diesel Engine (Optional) keeps Thermic fluid moving to avoid overheating and overflow of oil. Exhaust with Damper provided on furnace to drive away hot gases directly. We have gained expertise in manufacturing, supplying and exporting a wide range of Oil Fired Thermal Fluid Heater that are widely used in chemical industries. These heaters are fabricated as per the international norms and standards. We manufacture these heaters as per the international norms and standards. Oiur dexterous team of professionals make use of advanced technology and modern tools to fabricate these heaters. Valued patrons can avail these heaters from us in both standardized and customized forms as per their needs. The company manufactures, supplies, and exports an impeccable range of 3 Pass Thermic Fluid Heater. This 3 Pass Thermic Fluid Heater is constructed as per the international quality guideline to ensure easy operation and low maintenance cost. Our 3 Pass Thermic Fluid Heater finds wide application in the Industrial sector for performing diverse vital tasks. Thermic Fluid system pressure high due to system valves closure etc. Pressure switch cuts of ID Fan and alarm. Safety relief valve (Optional) to be provided in the system piping so as to by pass the oil. We also cater the export orders from major countries like Bangladesh,Kenya,Srilanka,South Africa, Nigeria, Iran, Saudi Arabia, UAE, Kuwait, Iraq, Philippines, USA, UK, Ghana, Germany, Canada and many more other countries.